Kim Sears brings a highly impressive resume of coaching and playing at the high school, club, and collegiate levels to Virginia Elite. Now in her 14th season with the club, Sears returns as the head coach of the 14’s team after coaching elite youth volleyball for two decades. 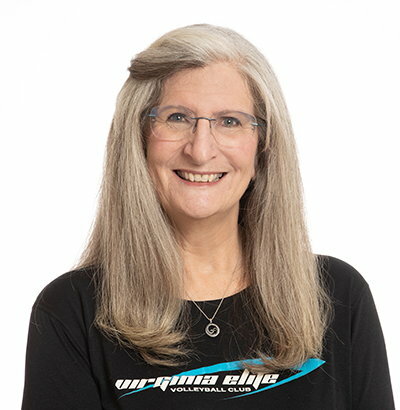 Since Virginia Elite’s inception in 2005, Sears has served as the head coach of multiple 13’s, 14’s, and 15’s teams, many of which placed in the open divisions of national qualifier tournaments and earned bids to the USAV National Championships. She also leads the 13’s-15’s academy practices and runs the middle school program. In 2017, she earned the Virginia Elite Diamond Coach Award for her dedication to the club. Sears assisted in coaching the Missouri State University men’s club team before taking over as the head coach of NCAA Division I George Mason University for five years. She later took a short sabbatical from coaching until her daughters began to play in the middle school program at Loudoun Youth Volleyball, where she became Chairman for three years. Sears then spent five years coaching her daughters’ teams at NVVA before they joined Virginia Elite. She also coached at Whitehall High School and Broad Run High School, as well as for a men’s A level and a women’s open level USAV team. Sears is CAP I, PCA, and Gold Medal Squared certified. Sears played collegiate volleyball and basketball at Tulane University, where she was the first female in any sport to earn an athletic scholarship, and was named MVP of the volleyball team. She then transferred to Missouri State and played on the 13th ranked team in the nation at the time. After graduating with a B.S. in both Biology and Education from MSU, she continued to compete on a women’s AA level USAV team. Sears met her husband and 14’s assistant coach, Dave, while playing volleyball. They had three daughters, two of whom are alumni of Virginia Elite; Sarah, who played at Stetson University, and Lauren and Emily, who played for the University of Southern Mississippi. They now reside in Ashburn, Virginia.